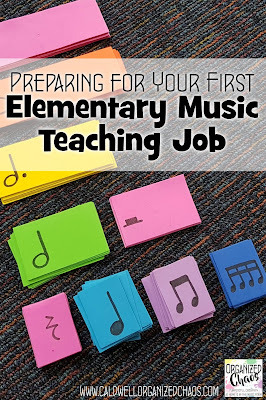 Whether you're fresh out of college and landed your first job, or changing positions to take on elementary music for the first time, there's a lot to do to get ready for your first elementary music teaching job! And I know that the summer before my first year, I spent a lot of time and energy worrying that I was forgetting something important that I should be doing to get ready. 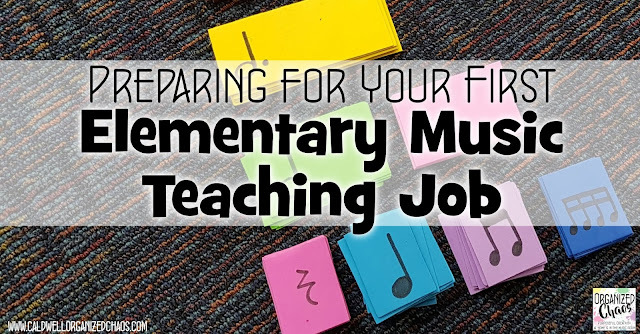 If you're looking ahead to your first job in elementary music, here are my top 5 suggestions for things to do to prepare for the most successful year possible! First of all, welcome to the most wonderful profession on the planet! :) I hope you are just as excited as I was to get started my first year. Teaching elementary music can be exhausting and even discouraging at times, but it is so meaningful and rewarding as well. Of course there's no way to anticipate everything and go into your first year completely prepared for everything that's in store, but the more you can do ahead of time, the easier it will be to adapt when unexpected challenges come your way. Go through every drawer, shelf, and closet (and re-organize the most important things you'll use right away in a way that makes sense for you). Make note of what instruments, curricular materials, and other equipment you have available to you. Move the furniture around and think about the best way to set up the room to maximize space and streamline transitions in and out of class, and between playing instruments, doing movement activities, writing, looking at the board, etc. What will the students need to do to get from one thing to the next? If there posters and bulletin boards up on the walls already and/or posters available for you to hang, spend time thinking about what you really need and want to have up on your walls. What will you want to reference in your teaching? Which things do you want students to be able to see readily during class, and which things will you only need them to see occasionally? Walk around the entire building. Make sure you know the fastest way to get to a) the staff bathroom, b) the copy machine, c) the office, and d) the staff room. You'll also want to get a feel for where all the other classrooms, gym, auditorium, cafeteria, and other rooms are around the building. Don't have a classroom? You'll definitely want to spend time getting to know your way around the building, organizing your materials, and finding out what space you have available for storage. 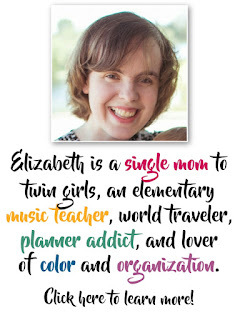 For more tips for teaching music from a cart, check out Music On A Cart- she has lots of suggestions for everything related to mobile music teaching! I truly believe this is the one thing you can do over the summer to have the biggest impact on your school year! It's time-consuming, but coming up with at least an outline of what you want to teach when for every grade you teach will make a huge difference in your lesson planning life during the school year. If there are textbooks or other curricular resources available in your room or district, use them as your guide. Of course you'll add your own spin on things, but having a solid foundation to start with will save you so much time and headaches! 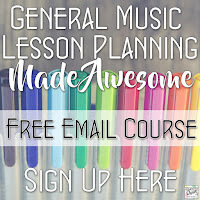 Whether you have a detailed curriculum resource or absolutely nothing at all, I highly recommend going through my free email course, Lesson Planning Made Awesome. 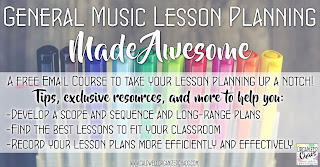 In the course I go through the entire process, from standards all the way to daily lesson plans, with all of the templates I use for my own planning. It is definitely worth your time to go through this process! As I mentioned already, part of your thought process as you think about your classroom will be to think through how students will move from one type of activity to another, and how they will begin and end class. Besides those procedures, you'll also want to think about how you'll handle students who want to use the bathroom, get a tissue, or go to the nurse, your procedures for getting out and cleaning up instruments, writing supplies, and other equipment, and make sure you know your building's procedures and policies for things like safety drills and office referrals. If at all possible, ask other teachers in the building for what they do for these procedures- the more you can align some of those basic procedures to the rest of the building the easier it will be for students to remember! Besides procedures and routines, you'll also want to have a clear plan for handling disruptive student behaviors. You need to be able to tell students on the first day what the consequences are for making poor choices so that there's less room for them to argue with you when it happens, and you don't have to fumble around either! Clarify in your own mind what your expectations are for students, and what you'll do to reinforce those expectations, create structure for your students, and help students learn how to behave appropriately in your class. Again, talking to other teachers and administrators in your building about behavior management systems is extremely valuable! I've also written extensively about how I foster a positive classroom climate and teach students appropriate behaviors- read through this post for concrete ideas and thoughts for behavior management and classroom routines in the elementary music setting. Get yourself on a healthy but realistic sleep schedule and put yourself on it now- your body will need lots of sleep and it takes time to adjust your body clock to a new schedule! Stock your freezer with healthy, pre-made meals, whether you make them yourself and freeze them or even buy pre-made food at the store. You're not going to have a lot of energy for cooking, especially in the beginning, so give yourself something besides fast food and takeout to eat on weeknights when you just want to collapse on the couch! Get yourself in a routine for managing your home and finances. Set up some sort of cleaning schedule for yourself, put as many bills as possible on auto-pay, and write down anything else that needs to be done less regularly on your calendar now (think oil changes, tax payments, doctor appointments, and other tasks that will be problematic if you forget them). You're going to get sick. More than once. Make sure you have some basic medical supplies to deal with illnesses when they happen: a thermometer, pain medicine, cough medicine, bandages, etc. If you don't already have an experienced music teacher to go to, find one! Having someone who is ready to listen to your sob stories, answer questions, and offer advice is invaluable in your first year of teaching and beyond. Ask if your school/ district has any mentoring programs in place, and find out if there are any experienced elementary music teachers to talk to. If not, reach out! You can get in touch with your local Orff, Kodaly, or other music teacher's organization, talk to teachers in neighboring schools, or even head online. There are plenty of Facebook groups for music teachers with lots of experienced teachers who are more than willing to help, and you can also reach out to me (or any other teacher-author)! Find someone with experience who is willing to be there when you need them. 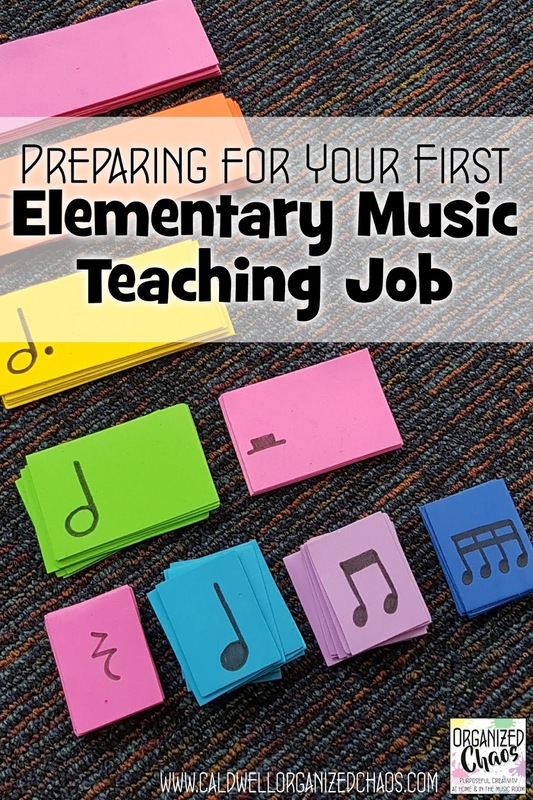 I hope these suggestions help you as you prepare for your first elementary music teaching job. There is a lot to do but it's just the start of a wonderful adventure! Stay in touch and get more timely ideas and resources sent straight to your inbox by signing up here for the Organized Chaos newsletter. I am starting my first elementary music teacher job in two weeks and feel like i just found a pot of gold! reading through your blog. Thank you so much for sharing these tips and resources... I am breathing a little easier now thanks to you. That's so great to hear!! Please reach out by email any time and let me know how things are going- congratulations on your new job and have a fantastic school year!